Crafty, Scrappy, Happy: My Happy. 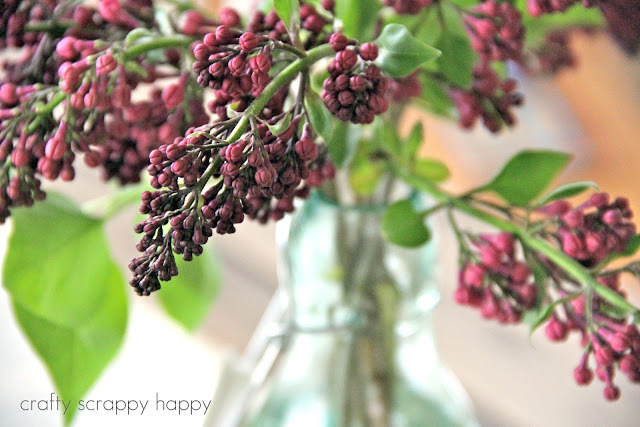 But this time of the year, my happy is----lilacs. 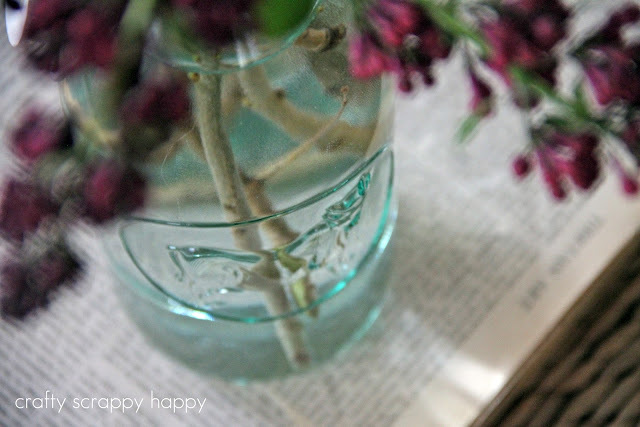 Do you have a happy? I completely agree with you. I love lilacs. The light and dark purple color and the smell. I have also thought about having lilacs as my wedding flowers. 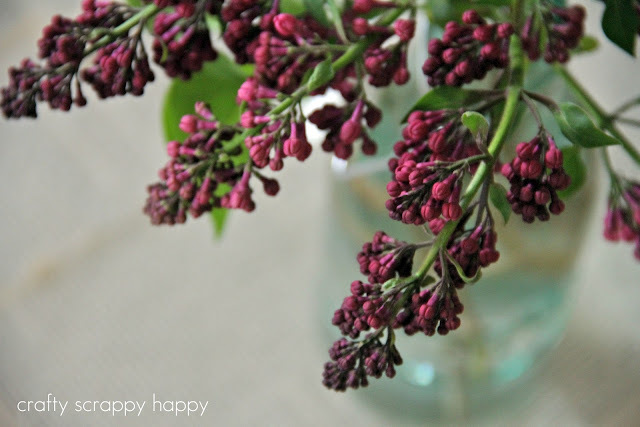 Omg, lilacs & hyacinths have THE BEST smell ever! No other flower compares, haha! They're my favorite! I think its all spring flowers in general. They all make me happy. Tulips and toad lilies are my fav, but all the lilacs, forsythia, crocus, daffodils make me smile. We paid lots for out of stock tulips to be in my wedding bouquet. It was a non negotiable budget doesn't matter item :) Thanks for the beautiful pics to brighten my morning! I love lilacs too! They are my absolute favorite. My parents have a bunch of lilac bushes all the way up their long driveway & it smells amazing at their house when they are blooming! Those are beautiful! I love the container you placed them in. Gorgeous. They really are lovely! Such a beautiful start to my day. Thanks for sharing your happy. Soon the lavender beauties will fill my air with scent, and maybe my kitchen too. Yes, lilacs! My other happy this time of year are those pink plum tree blossoms. They smell DELICIOUS, and I love how many memories they bring forth. Happy spring!! Maggie where is this town? I think I need to go there and take in the sights and smells! 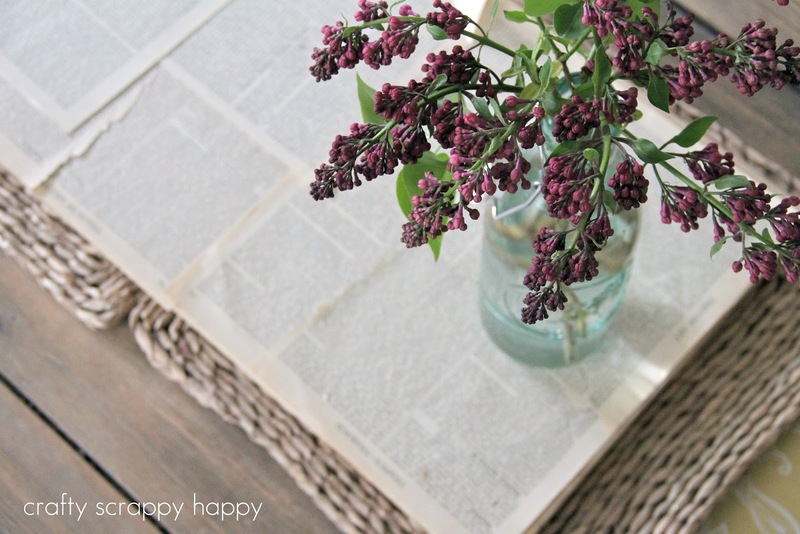 So TOTALLY with you .... LOVE LOVE LOVE lilacs! Too bad they won't be blooming around here for quite a while! But I have something to look forward to! 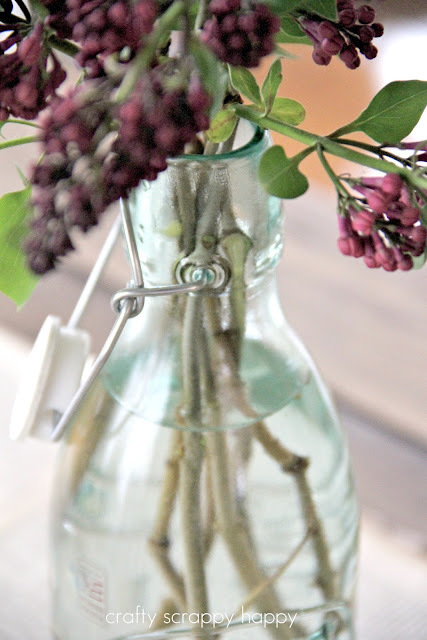 Growing up in Wisconsin, our hose was surrounded by lilac trees. I remember my Mom used to open up the windows just so we could get a wiff of the wonderous smells just outside our door. I have fond memories of lilacs because they remind me of my Mom. 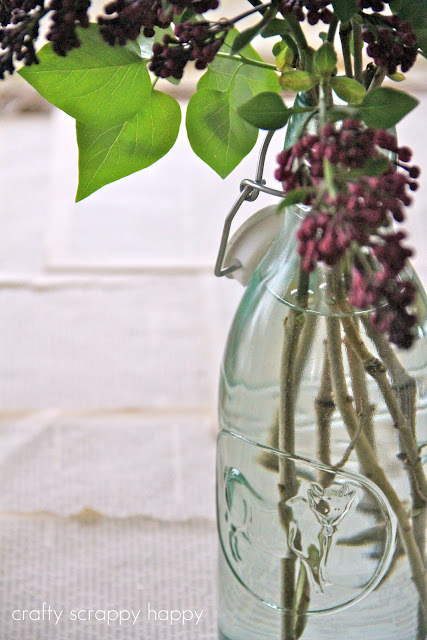 When I moved to South Carolina after her death, I dug up 10 lilac shoots and hauled them in ice cream buckets to my new home. Unfortunately, I was unaware that lilacs can not survive the severe heat of the south and I watched them all die. It made me very sad and whistful for their scent again. 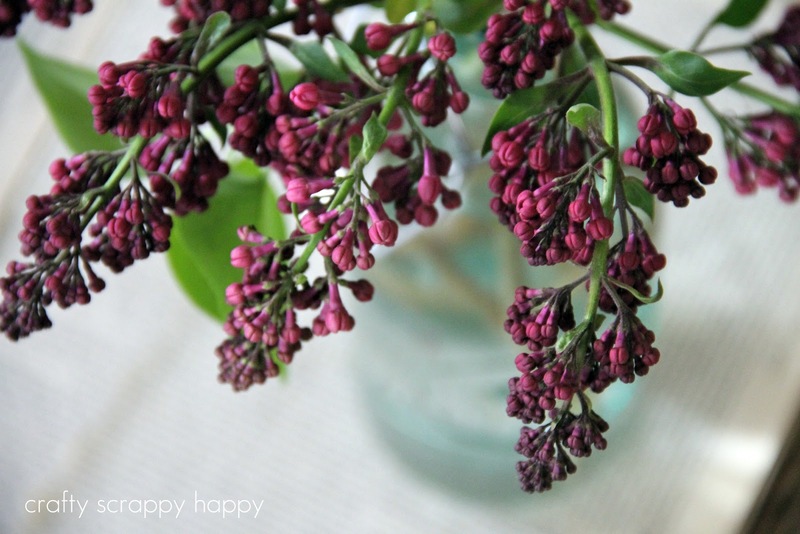 Just recently, I moved to Michigan and I had hopes of seeing lilacs blooming once again. I searched through my new yard and to my dismay, I did not locate a single, solitary lilac tree until....one day, I was outside with my doglets and I saw the pathetic looking Charlie Brown lilac tree "trying" to show it's scrappy self amongst some bushes. There it was though, a few blooms to instantly bring me back to my childhood. It's snowing in Michigan today and I am going to cut off every single bud on that small tree and bring the happiness indoors lest they freeze to death outside. I can't wait to inhale that special scent delivered to me straight from Heaven and my Mom. I'm so glad there are other people out there that love lilacs as I do. I can't wait until they are in bloom around here! We have a row of lilac bushes in our yard. They are so pretty. They truly make you smile. I have a big lilac bush right outside my window at my apartment. :) Can't wait until it blooms! !